Please find attached agenda for the General Meeting to be held at the Roma Administration Centre on June 25, 2014 at 9.00am. The Mitchell RSL and Combined Sports Club is the management organisation that manages the day-to-day operations of the Mitchell RSL and Combined Sports Complex. The Club is the governing body that auspices other clubs that use the facility including the Mitchell Junior Rugby League and Netball Club, Mitchell Senior Rugby League Club, Mitchell Campdraft Association, Mitchell Rodeo Association and the Mitchell Cricket Club. Council has historically had an affiliation agreement with the clubs and has been in negotiations with the club’s in regard to entering a new agreement. 4. Furthermore, Council delegate authority to the Chief Executive Officer to sign the affiliation agreement on behalf of Council. In the past, Booringa Shire Council had an affiliation agreement with the Mitchell R.S.L and Combined Sports Club Incorporated and its member clubs. This agreement was executed in 2007. This affiliation agreement outlined the relationship between Council and the Club, and each parties responsibilities including administrative support to be provided by council. Council renew its affiliation agreement with the Mitchell R.S.L and Combined Sports Club Incorporated and associated clubs for a period of 5 years with each party to have the same or similar responsibilities as the existing agreement executed in 2007, any alterations to responsibilities will be subject to the agreement of the Committee and Council. In accordance with Council’s resolution, the affiliation agreement was prepared and sent to the Club’s Chairperson Mr Robert Lethbridge, but as the committee had not had an Annual General Meeting since September 2009 (due to unavailability of the Annual Financial Statements) he refused to sign the affiliation agreement. All outstanding financial statements have now been prepared and ratified by the club at their Annual General Meeting on 21 August 2013. The affiliation agreement was established and documented to enable the listed committees to use the Council owned facilities at the Mitchell R.S.L and Combined Sports Complex under the auspices of the Mitchell R.S.L and Combined Sports Club and to address each party’s rights and obligations. Under the agreement Council is responsible for the overall management and control of the Council owned facility, insurance, ensuring the safety of people and property using the facility, and provision of administration of the Mitchell R.S.L and Combined Sports Club including preparing financial accounts and statements for all parties. The Mitchell R.S.L and Combined Sports Club is the governing body for all the other sporting organisations party to the agreement. The Mitchell R.S.L and Combined Sports Club is responsible for acting as an agent and principal for the other sporting clubs party to the agreement. The Mitchell R.S.L and Combined Sports Club has an employee who is managed and funded by the club. The Club is also responsible for coordinating use of the ovals and grounds, resolving any conflicts between clubs, meeting liquor licensing requirements and reporting any maintenance or public risk issues to Council for rectification. The former President of the Mitchell Mud Rats has confirmed that the group isn’t currently functioning and hasn’t held a meeting for a number of years. • This arrangement places responsibility for day-to-day management of the sporting facility with the local community. The affiliation agreement includes in Council’s responsibilities that Council will provide a Secretary/Treasurer for the club including all the duties of a club Secretary/Treasurer being preparation of financial statements, payment of accounts, banking, writing correspondence, attendance at meetings, taking of minutes and preparation of agendas. Council is currently paying an Accountant on a contract basis to maintain the club’s financials including preparation of the annual financial statements, preparation of banking and upkeep of the club’s bookkeeping system. This service has cost Council on average $467.50 (including GST) per month. • The Secretary/Treasurer is to be an employee in a management role of the Maranoa Regional Council who is located in the Mitchell Office. At Councillor Workshops held on 30 November 2013 and 10 June 2014, Council was asked to consider and provide direction as to the level of assistance it wished to provide to the club’s. Councillors have also consulted with the Presidents of affiliated clubs in regards to the nature of the ongoing relationship between Council and the clubs moving forward. 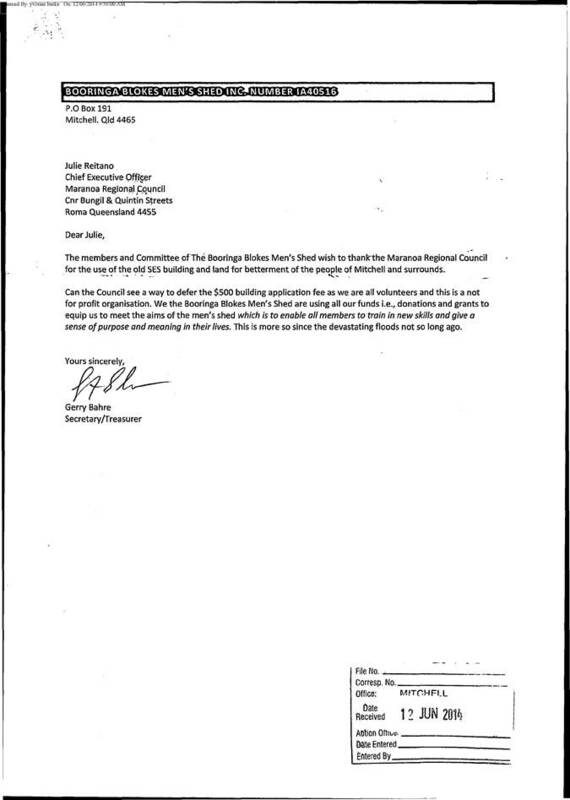 At the meeting held on 8 May 2014 (unconfirmed minutes attached), the Mitchell RSL and Combined Sports Club representatives in attendance resolved to support the draft affiliation agreement as presented. A copy of the draft affiliation agreement, as supported by the club, is attached for Councillors perusal and consideration. Members of Junior Rugby League and Netball Club, Senior Rugby League Club, Campdraft Association, Rodeo Association, Cricket Club. Council may set a future precedent for other shared use facilities within the region. Nil. Council has traditionally had an affiliation agreement with the Mitchell RSL and Combined Sports Club. Costs of agreement and ongoing support accommodated in Facilities Operational Budget. Corporate Plan 2009-2013 — 8.2.4(a) To maintain and present Council’s community facilities in a manner appropriate to the standard expected by users for each respective facility within budgetary constraints whilst considering organisational sustainability. Draft Affiliation Agreement between Maranoa Regional Council and Mitchell RSL and Combined Sports Club Inc and 6 other sporting organisations. Mitchell R.S.L. & Combined Sports Club Inc.
Name Mitchell R.S.L. and Combined Sports Club Inc.
A. Maranoa Regional Council is the owner of certain sporting grounds and facilities located in Mitchell as identified on the plan set out in Annexure A. B. Mitchell R.S.L. and Combined Sports Club is an incorporated association which operates a licensed club house facility and manages the usage and operation of the Maranoa Regional Council grounds and facilities as agent for certain sporting clubs. C. Mitchell Junior Rugby League and Netball Club operates as a committee of Mitchell R.S.L. and Combined Sports Club to facilitate organised junior rugby league and netball sporting fixtures. D. Mitchell Senior Rugby League Club operates as a committee of Mitchell R.S.L. and Combined Sports Club to facilitate organised senior rugby league sporting fixtures. E. Mitchell Campdraft Association operates as a committee of Mitchell R.S.L. and Combined Sports Club to facilitate organised campdraft competitions. F. Mitchell Rodeo Association operates as a committee of Mitchell R.S.L. and Combined Sports Club to facilitate organised Rodeo competitions. G. Mitchell Cricket Club operates as a committee of Mitchell R.S.L. and Combined Sports Club to facilitate cricket fixtures. H. Mitchell Junior Rugby League and Netball Club operates as a committee of Mitchell R.S.L. and Combined Sports Club to facilitate junior rugby league and netball sporting fixtures. Maranoa Regional Council Facilities means the grounds and facilities owned by Maranoa Regional Council as identified on the plan set out in Annexure A. Business Day means a day on which banks are open for retailing banking, other than a Saturday, Sunday or Public Holiday, in Brisbane, Australia. Commencement Date means the day of 2014. GST Law has the meaning given to “GST Law” in the A New Tax System (Goods and Services Tax) Act 1999 (Cth). GST has the meaning given by the GST Law. Term means the duration of this Agreement, commencing on the Commencement Date and finishing on the Termination Date. Termination Date means that day upon which termination occurs in accordance with clause 18. This clause 1.2 specifies the rules for interpreting this document, except where context makes it clear that a rule is not intended to apply. (a) The contents page[s] (if any), the Background and headings are for convenience only and do not affect the interpretation of this document. (ix) A clause, schedule or annexure is to a clause of, or schedule or annexure to, this document. (d) A word which suggests one gender includes any other genders. (e) If a word is defined, another part of speech of that word has a corresponding meaning. (f) If an example is given of anything (including a right, obligation or concept), such as by saying it includes something else, the example does not limit the scope of that thing. is the obligation, warranty or right (as the case may be) of those persons jointly and severally. (i) A reference to the date or time of day, is a reference to that date or that time of day in Queensland, Australia. (b) including the day on which the purpose is to be fulfilled. (b) the corresponding day in the next year appropriate week, calendar month or year. (iv) If there is no corresponding day for the purpose of clause 1.2(h)(iii)(b), because of the differing number of days in calendar months, the corresponding day is taken to be the last day of the relevant calendar month. (v) If something is to be done on a particular day, it must be done by 5:00pm on that day. (vi) If something is to be done on a day which is not a Business Day then that thing must be done on the next working day. (i) Terms defined in the GST Law have the same meaning in this document unless the context makes it clear that a different meaning is intended. subject always to the exercise of sound business judgement and the due observation of confidentiality obligations. This affiliation was established and documented to enable committees’ usage of the Maranoa Regional Council Facilities under the auspices of Mitchell R.S.L. and Combined Sports Club and to address each party’s rights and obligations. (e) Enhancing the financial viability of affiliated sporting bodies. (i) Establishing a Management Structure. (c) Working with the parent body. (e) Protection of member details under the provisions of the National Privacy Legislation. (m) Contribute to indirect expenditure for club operations. Maranoa Regional Council shall have overall management and control of the Maranoa Regional Council Facilities. All written enquiries should be addressed to the Chief Executive Officer of Maranoa Regional Council. Maranoa Regional Council will review insurance coverage for all parties; particularly as it pertains to usage of the Maranoa Regional Council Facilities and to ensure at all times the safety of people and property using the Maranoa Regional Council Facilities. Maranoa Regional Council will give direction to all parties who use the Maranoa Regional Council Facilities. Maranoa Regional Council consent is not required to be given to any party (to this Agreement) intending to use the Maranoa Regional Council Facilities. Hire of the Maranoa Regional Council Facilities to third parties can be undertaken by Mitchell R.S.L. and Combined Sports Club provided charges are paid. Maranoa Regional Council will undertake administration of the Mitchell R.S.L. and Combined Sports Club and prepare financial accounts and statements for all parties. Maranoa Regional Council will maintain the grounds and buildings to a standard not detrimental to the use of the facilities. Mitchell R.S.L. and Combined Sports Club is the governing body for all other parties to this Agreement (other than Maranoa Regional Council). (a) Mitchell R.S.L. and Combined Sports Club acts as an agent and principal for these parties (other than Maranoa Regional Council). (b) When major functions are being conducted a meeting will be convened between all key stakeholders. Mitchell R.S.L. and Combined Sports Club has an obligation under the Harmonised Workplace Health and Safety Act 2012 to provide a safe place and a safe system of work so as not to place at risk Mitchell R.S.L. and Combined Sports Club’s own employees as well as other workers and the general public at the workplace. Mitchell R.S.L. and Combined Sports Club must comply with all relevant enactments, the associated Workplace Health and Safety Regulations, Standards and Codes of Practices. Mitchell R.S.L. and Combined Sports Club has an obligation to take all practicable steps to ensure the workplace health and safety of its employees, contractors and sub-contractors and their employees and all other people (not employees) who may be affected by Mitchell R.S.L. and Combined Sports Club work practices. (b) Workers compensation insurance as required under Workers Compensation legislation for both the parties and delegates. Mitchell R.S.L. and Combined Sports Club must, on demand by Maranoa Regional Council, produce sufficient evidence that the insurance requirements under clause 4.4 are current. However, an important onus is placed on all parties to the Agreement who use the Maranoa Regional Council Facilities to ensure that no event is conducted unless evidence of appropriate insurance coverage is provided to either of Mitchell R.S.L and Combined Sports Club or Maranoa Regional Council. Mitchell R.S.L. and Combined Sports Cub must not do anything or allow anything to be done which might cause the insurances in clause 4.4 to be cancelled, avoided or otherwise prejudiced. Mitchell R.S.L. and Combined Sports Club is responsible for providing its cover (and as relevant for the other parties) for property, plant and equipment. Mitchell R.S.L. and Combined Sports Club acknowledges that Maranoa Regional Council is not liable for any damage, loss or theft of its (or the other parties) personal property, plant and equipment, unless directly caused by Maranoa Regional Council. Mitchell Junior Rugby League and Netball Club must comply with all reasonable directions issued by Maranoa Regional Council as to the use of the Maranoa Regional Council Facilities (for the purposes of conducting junior rugby league and netball sporting fixtures). Mitchell Junior Rugby League and Netball Club must ensure that it has in place and maintains all necessary approvals and registrations required by legislation or appropriate governing sporting bodies to conduct junior rugby league and netball sporting fixtures. Mitchell Junior Rugby League and Netball Club has an obligation under the Harmonised Workplace Health and Safety Act 2012 to provide a safe place and a safe system of work so as not to place at risk Mitchell Junior Rugby League and Netball Club’s own employees as well as other workers and the general public at the workplace. Mitchell Junior Rugby League and Netball Club must comply with all relevant enactments, the associated Workplace Health and Safety Regulations, Standards and Code of Practices. Mitchell Junior Rugby League and Netball Club has an obligation to take all practicable steps to ensure the workplace health and safety of its employees, contractors and sub-contractors and their employees and all other people (not employees) who may be affected by Mitchell Junior Rugby League and Netball Club work practices. Mitchell Junior Rugby League and Netball Club must ensure that it has in place and maintains all necessary insurance as required in clauses 4.4 – 4.8 (inclusive) and as otherwise required by Maranoa Regional Council. Mitchell Senior Rugby League Club must comply with all reasonable directions issued by Maranoa Regional Council as to the use of the Maranoa Regional Council Facilities (for the purposes of conducting senior rugby league sporting fixtures). Mitchell Senior Rugby League Club must ensure that it has in place and maintains all necessary approvals and registrations required by legislation or appropriate governing sporting bodies to conduct senior rugby league sporting fixtures. Mitchell Senior Rugby League Club has an obligation under the Workplace Harmonised Workplace Health and Safety Act 2012 to provide a safe place and a safe system of work so as not to place at risk Mitchell Senior Rugby League Club’s own employees as well as other workers and the general public at the workplace. Mitchell Senior Rugby League Club must comply with all relevant enactments, the associated Workplace Health and Safety Regulations, Standards and Code of Practices. Mitchell Senior Rugby League Club has an obligation to take all practicable steps to ensure the Workplace Health and Safety of its employees, contractors and sub-contractors and their employees and all other people (not employees) who may be affected by Mitchell Senior Rugby League Club’s work practices. Mitchell Senior Rugby League Club must ensure that it has in place and maintains all necessary insurance as required in clauses 4.4 – 4.8 (inclusive) and as otherwise required by Maranoa Regional Council. Mitchell Campdraft Association must comply with all reasonable directions issued by Maranoa Regional Council to the use of the Maranoa Regional Council Facilities (for the purpose of conducting campdraft sporting fixtures). Mitchell Campdraft Association must ensure that it has in place and maintains all necessary approvals and registrations required by legislation or appropriate governing sporting bodies to conduct campdraft sporting fixtures. Mitchell Campdraft Association has an obligation under the Harmonised Workplace Health and Safety Act 2012 to provide a safe place and a safe system of work so as not to place at risk Mitchell Campdraft Association’s own employees as well as other workers and the general public at the workplace. Mitchell Campdraft Association must comply with all relevant enactments, the associated Workplace Health and Safety Regulations, Standards and Code of Practices. Mitchell Campdraft Association has an obligation to take all practicable steps to ensure the Workplace Health and Safety of its employees, contractors and sub-contractors and their employees and all other people (not employees) who may be affected by Mitchell Campdraft Association’s work practices. Mitchell Campdraft Association must ensure that it has in place and maintains all necessary insurance as required in clauses 4.4 – 4.8 (inclusive) and as otherwise required by Maranoa Regional Council. Mitchell Rodeo Association must comply with all reasonable directions issued by Maranoa Regional Council to the use of the Maranoa Regional Council Facilities (for the purpose of conducting rodeo sporting fixtures). Mitchell Rodeo Association must ensure that it has in place and maintains all necessary approvals and registrations required by legislation or appropriate governing sporting bodies to conduct rodeo sporting fixtures. Mitchell Rodeo Association has an obligation under the Harmonised Workplace Health and Safety Act 2012 to provide a safe place and a safe system of work so as not to place at risk Mitchell Rodeo Association‘s own employees as well as other workers and the general public at the workplace. Mitchell Rodeo Association must comply with all relevant enactments, the associated Workplace Health and Safety Regulations, Standards and Code of Practices. Mitchell Rodeo Association has an obligation to take all practicable steps to ensure the Workplace Health and Safety of its employees, contractors and sub-contractors and their employees and all other people (not employees) who may be affected by Mitchell Rodeo Association’s work practices. Mitchell Rodeo Association must ensure it has in place and maintains all necessary insurance as required in clauses 4.4 - 4.8 (inclusive) and as otherwise required by Maranoa Regional Council. Mitchell Cricket Club must comply with all reasonable directions issued by Maranoa Regional Council as to the Maranoa Regional Council Facilities (for the purpose of conducting cricket sporting fixtures). Mitchell Cricket Club must ensure that it has in place and maintains all necessary approvals and registrations required by legislation or appropriate governing sporting bodies to conduct cricket sporting fixtures. Mitchell Cricket Club has an obligation under the Harmonised Workplace Health and Safety Act 2012 to provide a safe place and a safe system of work so as not to place at risk Mitchell Cricket Club‘s own employees as well as other workers and the general public at the workplace. Mitchell Cricket Club must comply with all relevant enactments, the associated Workplace Health and Safety Regulations, Standards and Code of Practices. Mitchell Cricket Club has an obligation to take all practicable steps to ensure the Workplace Health and Safety of its employees, contractors and sub-contractors and their employees and all other people (not employees) who may be affected by Mitchell Cricket Club’s work practices. Mitchell Cricket Club must ensure it has in place and maintains all necessary insurance as required in clauses 4.4 - 4.8 (inclusive) and as otherwise required by Maranoa Regional Council. (a) Each party will be separately responsible for their own accounting records required by law or any other accounting reports required by any governmental agency with respect to its operation. (b) Notwithstanding 11(a) above, Maranoa Regional Council agrees to maintain accounting records for Mitchell R.S.L. and Combined Sports Club and the parties the subject of this affiliation. The liabilities and obligations of the parties under this Agreement arising out of or in connection with the operations of the affiliation will be several and not joint or joint and several and will be borne by them severally in their respective interests. Nothing in this Agreement will be interpreted or considered as constituting the relationship between the parties as a partnership, quasi-partnership, association or any other relationship in which any one of the parties may be liable for the acts or omissions of the other parties, or in which the parties may share profits. (a) Nothing in this Agreement will be considered or interpreted as constituting any party the agent or representative of any other party. In particular, no party will have the authority to pledge or purport to pledge the credit of any other party or to make or give, or purport to make or give, any representation, warranty or undertaking for or on behalf of any other party. (b) Notwithstanding the provisions of 14(a) above, the parties acknowledge and agree that all parties to this Agreement may (with unanimous consent) appoint one or any of them as agent for the purposes of representing all of any of the parties in negotiations with third parties. Such appointment shall be on terms and conditions that are acceptable to all of the parties and with the implied purpose of furthering the alliance. No party will be taken to be a trustee for any other party except as expressly provided in this Agreement. To the extent to which a party owes a fiduciary duty to the other party, it will in the performance of that duty, be entitled to have primary regard to its own commercial interests. (c) It has taken all necessary action (where appropriate) to authorise the entry into and perform this Agreement. and, does not and will not create or impose any security interest on any party’s assets. The Term of this Agreement shall commence on the Commencement Date and shall continue until the Termination Date. (c) Upon the failure or default of any of the parties to observe all material or substantial terms and conditions of this Agreement and written notice specifying such default has been given and such default has not been rectified within 30 days thereof. (e) If another party fails to comply with Maranoa Regional Council Workplace Health and Safety Policies and Procedures. Any obligations that by their nature continue after the termination of this Agreement, specifically including the confidentiality provisions herein, shall remain binding on the parties. Upon termination of this Agreement by Maranoa Regional Council pursuant to clause 18.2, no other party is entitled to claim compensation or damages from Maranoa Regional Council in relation to that termination. Upon termination of this Agreement, the parties (other than Maranoa Regional Council) shall immediately vacate the Maranoa Regional Council premises. arising directly or indirectly as a result of or in connection with a breach or non-performance of any of the obligations of the party under this Agreement, whether express or implied. The indemnifying party must pay to the others all liabilities and costs referred to in clause 19, whether or not the others have paid or satisfied them. and the parties agree to treat the same as Confidential Information and not to divulge the information to any third party without the prior consent in writing of the other parties. If the parties consent to disclosure of Confidential Information they must ensure that the authorised recipient is advised of the confidential nature of the information and of the fact that it may not be divulged without the prior consent in writing of all parties. (d) Where the information is already in the public domain or is lawfully obtained by the disclosing party from sources other than this Agreement. Each party must procure that its officers, employees and agents act in accordance with the terms of this clause. To the extent that any of its officers, employees or agents do not act in accordance with this clause 20, then that party will be liable for the actions of its officers, employees and agents. All amounts payable under or in accordance with this document are exclusive of GST. (a) A recipient of a taxable supply under or in connection with this document must pay to the supplier, in addition to the GST exclusive consideration for the taxable supply, an amount equal to any GST paid or payable by the supplier in respect of the taxable supply (GST Amount). (b) The recipient must pay the GST amount to the supplier when the GST exclusive consideration or part of it is provided, except that the recipient need not pay the GST amount unless the recipient has received a tax invoice (or an adjustment note) for that taxable supply. Where a supplier incurs a cost or expense for which it may claim payment, reimbursement or indemnity for another party under or in connection with this document, the amount to be paid or credited to the supplier is the cost or expense (reduced by the input tax credit that the supplier is entitled to claim in respect of that cost or expense) plus the amount in respect of GST payable by the recipient as calculated under clause 21.2. (b) Delivered or sent by prepaid post or fax to the party’s address specified in the Details of Parties on Page 6, or any other address notified by a party to the party or parties. A Notice given in accordance with clause 22.1 takes effect when received, or at a later time specified in it. but if the delivery, receipt or transmission is not on a Business Day, or is after 5:00pm on a Business Day, it is taken to be received at 9:00am on the next Business Day. (b) In the case of service by fax, the notice is not received in full and legible form. A party may only dispose of, deal with, declare a trust over or otherwise create an interest in, its rights under this document with the prior consent of each other party. A party may exercise a right or remedy or give or refuse its consent in any way it considers appropriate (including by imposing conditions), unless this document expressly states otherwise. By giving its approval or consent, a party does not make or give any warranty or representation as to any circumstance relating to the subject matter of the consent or approval. A party is not liable to another party for loss caused by the exercise or attempted exercise of, failure to exercise, or delay in exercising a right or remedy under this document. A party’s rights and remedies under this document may be exercised even if it involves a conflict of interest or a party has a personal interest in their exercise. The rights and remedies provided in this document are in addition to other rights and remedies given by law independently of this document, except to the extent that those other rights and remedies are expressly excluded in this document. Any legislation that diminishes the obligation of a party, or adversely affects the exercise by a party of a right or remedy, under or relating to this document is excluded to the full extent permitted by law. This document can only be amended, supplemented, novated or replaced by another document signed by the parties. A right under this document can only be waived by notice signed by the party or parties waiving the right. A party does not waive its rights under this document because it grants an extension or forbearance to any other party. A waiver of a right on one or more occasions does not operate as a waiver of that right if that right arises again. The exercise of a right does not prevent any further exercise of that right or of any other right. If a party does not exercise a right or remedy fully or at a given time, the party may still exercise it later. and those rights and obligations at all times remain in full force and effect. (a) Rights accrued to a party up to the date of termination or expiration of this document. (b) Indemnities and obligations of confidence given by a party under this document. It is not necessary for a party to incur expense or make a payment before enforcing a right of indemnity under this document. Each party agrees, at its own expense, to do anything (including ensuring that its employees and agents do anything) that any other party reasonably requires (such as obtaining consents, signing and producing documents) as may be necessary or desirable to give full effect to the provisions of this document and the transactions contemplated by it. This document embodies the entire Agreement between the parties and supersedes all previous agreements, understandings, negotiations, warranties and representations on the subject matter of this document. If this document is inconsistent with any other agreement between any of the parties, this document prevails to the extent of the inconsistency. No rule of construction applies to the disadvantage of a party because that party was responsible for the preparation of, or seeks to rely on, this document or any part of it. If the whole, or any part, of a provision of this document is void, unenforceable or illegal in a jurisdiction, it is severed for that jurisdiction. The remainder of this document has full force and effect, and the validity or enforceability of that provision in any other jurisdiction is not affected. This clause has no effect if the severance materially alters the nature or intended effect of this document. Each party will bear its own costs and expenses in relation to the negotiation, preparation, execution, delivery, registration and completion of this document and any related documentation. (b) On any transaction contemplated by this document. warrants that he or she has authority to do so, and will produce written evidence of that authority to any party who requests it. Time is of the essence with respect to all provisions of this document that specify a time for performance. This document is governed by the law in force in Queensland, Australia. Each party irrevocably submits to the non-exclusive jurisdiction of the courts exercising jurisdiction in Queensland, and any court that may hear appeals of those courts for any proceeding in connection with this document, and waives any right it may have to claim those courts are an inconvenient forum. This document may be executed in counterparts. A counterpart may be a facsimile copy of this document. All counterparts together are taken to constitute one instrument. A facsimile copy of this document which has been executed by a party (Signatory) may be relied upon by a party to the same extent as if it was an original of this document executed by the Signatory. Without limiting the generality of any provisions of this Agreement, the parties agree that in the performance of their respective duties and the exercise of their respective powers under this Agreement and in their respective dealings with each other, they will act in good faith. (c) Not impeding or restraining the other parties’ performance of this Agreement. Upon any dispute between the parties, whether with respect to the interpretation of any term of this Agreement or with respect to the performance of any obligation under this Agreement, at the request of any party, each party will designate a representative (which may be the named party itself) to attempt to resolve such dispute. The designated representative will use all responsible endeavours to resolve the dispute over a period of ten (10) Business Days, unless he or she concludes that an amicable resolution of the matters in issue through such efforts, do not appear likely. The specific format for such discussions will be left to the discretion of the designated representatives but may include preparation of agreed upon statements of fact or written statements of position. If the dispute can not be resolved, pursuant to this clause 25 the parties will refer the matter to dispute resolution in accordance with clause 26. A dispute shall be submitted to mediation under this Agreement by written notice (Dispute Notice) to the other party setting out details of the dispute. (a) The mediator will be selected by agreement of the parties. (b) If the parties can not agree on a mediator within seven (7) days after service of the Dispute Notice, a mediator will be designated by the President for the time being of the Queensland Law Society at the request of any party. (a) The mediation will be conducted as specified by the mediator and agreed upon by the parties. (ii) Attempt, with the assistance of the mediator, to reach an expeditious and amicable resolution of the dispute. (a) The mediation will be treated as a settlement discussion and therefore any disclosures / exchanges, whether written or oral, in the course of mediation will be confidential. (b) This Agreement does not restrict the parties’ freedom to disclose and discuss the course of proceedings and exchanges within the mediation with their advisers and insurers, provided always that any such disclosures and discussions will only be on this same basis of confidentiality. (c) The mediator must not testify for any party or any third party in any later proceeding relating to the dispute. (d) No recording or transcript shall be made of the mediation proceedings. (e) Documents or other materials brought into existence for or as a result of the mediation will also be confidential and privileged (any use of which within the context of the mediation will not constitute a waiver of such confidentiality and privilege) and will not be used in later proceedings and will not be discoverable or otherwise able to be used in later proceedings. (a) Each party will bear its own costs in the mediation. (b) The fees and expenses of the mediator and other costs relating to the conduct of the mediation, including but not limited to room hire, will be shared equally by the parties. If a dispute has not been resolved within 90 days of service of the Dispute Notice (or a longer period, if the parties agree to extend the mediation), the mediation shall terminate and any party can bring proceedings in a Court of competent jurisdiction. Present: Geoff Lawson, John Birkett, Peter Flynn, Jan Chambers, John Freegard, Bruce Smith and Rob Hayward. “That apologies be received and leave of absence be granted for: Noel Kennedy, Chris Hughes, Andy Hughes, Rob Lethbridge and Brendan Harrison. Rob Hayward provided an update on audit findings. Confirmed previous audit findings and no irregularities were identified. Council to write to NJ Contracting regarding the placement of gravel at the camp on the land adjoining the Complex in lieu of rent. Council Builder to undertake maintenance work at the Complex Building. Group recommended that a full time person be assigned to ground maintenance at the Complex and the area surrounding spa/hall. Purchase of goods - to let the provider know of current prices so that she can increase accordingly. Council to investigate if it is possible for the Campdraft and Rodeo Committee to check for online nominations received directly into the Mitchell RSL & Combined Sports Club bank account. The Affiliation Agreement is to be submitted to Maranoa Regional Council at the June workshop for consideration. Next Meeting: Date to be confirmed. Executive Summary: The Booringa Blokes Men’s Shed Inc. has requested a refund of the Building Application Fees paid to Council ($587.80) for Building Works at 90 Mary Street, Mitchell. Officer’s Recommendation: Council refund the building application fees paid for the approval of building works for the Booringa Blokes Men’s Shed Inc. at 90 Mary Street, Mitchell. Body of Report: The Booringa Blokes Men’s Shed Inc. has secured a grant to construct a new shed at the former SES site located at 90 Mary Street, Mitchell. While the grant is substantial it does not cover the building application fees associated with the development. The Booringa Blokes Men’s Shed Inc. have requested a refund of the building application fees ($587.80) paid to Council for certification of the new shed. The Booringa Blokes Men’s Shed Inc. is a ‘Not-for-Profit’ organisation run by volunteers, with all funds collected as donations and grants. Consideration should be given to the fact that the organization is ‘Not for Profit’ and the loss of revenue to Council for building fees is minimal in comparison to the social benefits that the organisation provides to the community. Council may receive other requests for fee refunds, however the circumstances surrounding each project will vary and therefore each application should be considered individually. $587.80 will be deducted from Council’s revenue for building certification services. Maranoa Regional Council has a has a current service agreement with the Department of Communities, Child Safety and Disability Services to provide Community Care Services. The Department has advised that Council has been approved for additional operational funding to provide social support and domestic assistance service types under the current service agreement. The increased amount of $3,212.62 will only be released if Council agree to sign the deed of variation. The deed of variation provides an increased capacity to deliver these service types within the Maranoa region. It is recommended that Council make a decision to sign the deed of variation to increase funding for the service types; social support and domestic assistance. The Department of Communities, Child Safety and Disability Services has a current service agreement with Maranoa Regional Council to provide community care services to younger persons under sixty- five years and under the age of fifty years for people who identify as Aboriginal and Torres Strait Islander, who have a functional disability and requires assistance to remain in their own homes. The Deed of Variation to increase operational funding is an annual recurrent amount to increase the capacity to provide social support and domestic assistance to this target group. Regardless of the recent decision to exit Community and Aged Care services, this funding would be of value to the client and could potentially offer the new service provider with an increased ability to provide these service types in the future. Following Consultation with Amanda Moffit – Community Services Officer for the Department of Communities, Child Safety and Disability Services the increase in recurrent funding has no risk implications to the exit plan being developed to relinquish services back to the Department of Communities, Child Safety and Disability Services. This funding and its allocated services will be transitioned to a new provider at the same time as all other services. If the Deed of Variation is not signed these additional services will be offered to other services providers which may not provide services within the Maranoa. Corporate Plan 2009-2013 — 8.4.7(a) To provide community care services in accordance with funding arrangements and agreements and within the limitation of council’s assessed community service obligation to address identified community needs. The purpose of this report is to adopt an Audit Committee Policy about the establishment of an Audit Committee pursuant to section 105 of the Local Government Act 2009 and Terms of Reference, which have been prepared for the Committee, setting out the specific responsibilities of the Audit Committee and the manner in which the Committee will operate. Furthermore, pursuant to section 210 (3) of the Local Government Regulation 2012 Council is required to appoint one (1) member of the Audit Committee as chairperson. b) Council appoint Bob Coomber as Chairperson for the Maranoa Regional Council Audit Committee. The purpose of the Audit Committee Policy is to meet the requirements of Section 105 of the Local Government Act 2009 regarding the establishment of an Audit Committee. The main purpose of the Committee is to provide advisory services to Council in the effective performance of its responsibilities as prescribed under the Local Government Act 2009 and the Local Government Regulation 2012. The Committee will have an oversight function and therefore exercises a monitoring and assessment role. The Audit Committee Terms of Reference sets out the specific responsibilities of the Audit Committee and details the manner in which the Committee will operate. This policy will guide the conduct of the Audit Committee in the performance of its oversight function in accordance with the Local Government Act 2009 and the Local Government Regulation 2012. No direct policy implications arise from this report. No direct financial or resource implications. Corporate Plan 2009-2013 — 8.1.1(b) To structure Council’s governance functions in a manner so as to allow effective and efficient utilisation of elected members time and resources to the benefit of the constituents which Council serves. The purpose of this policy is to meet the requirements of Section 105 of the Local Government Act 2009 regarding the establishment of an Audit Committee. • comply with legislative requirements of the Local Government Act 2009 and Local Government Regulation 2012. This policy will apply to Council’s elected members and external representatives appointed to the Audit Committee and non voting members such as Council employees and Council’s Internal and External Auditors. Council acknowledges and will abide by the provisions of section 208 to 211 of the Local Government Regulation 2012 regarding the composition, roles and responsibilities of the Audit Committee. The Committee will have an oversight function and therefore exercises a monitoring and assessment role. The Audit Committee Terms of Reference sets out the specific responsibilities of the Audit Committee and details the manner in which the Committee will operate. (iii) the effectiveness and objectivity of the local government’s internal auditors. Make recommendations to Council about any matters that the audit committee considers need action or improvement. § Review of management response to external auditor’s recommendation and extent of implementation (assessing the policies and procedures adopted by management to address these matters). § Assess and monitor the effectiveness, independence and objectivity of internal audit. d) the auditor-general’s audit report and auditor-general’s observation report about the local government’s financial statements for the preceding financial year. Further, pursuant to section 211(3) of the Local Government Regulation 2012 the Audit Committee may, for performing its functions under subsection 211(1)(b), seek information or advice from the person who has carried out the internal audit. However, the main responsibility for financial and risk reporting, governance, compliance with legislation, standards and ethical requirements within Council rests with management. The Committee will be composed of six (6) voting members. Council will appoint two (2) Councillors as members. Council can at any time appoint a stand-in or replacement Councillor member to the Audit Committee. The other four (4) members will be external and independent to Council, one of whom shall be appointed by Council as the Audit Committee Chairperson. The external members are expected to possess local government or financial experience and expertise, with a least one (1) member having significant financial experience and skills. The external members are appointed on the basis of personal qualities and skills and a proxy is not permitted if the external member is unable to attend meetings. External member terms and conditions shall be disclosed in the Letter of Appointment. Appointments of external persons shall be made by way of a public advertisement; an evaluation of candidates and a recommendation for appointment put to Council. The evaluation of potential external members will be undertaken by the Mayor or a nominated Councillor, Chair of the Audit Committee and Chief Executive Officer, taking account of the experience of candidates and their likely ability to apply appropriate analytical and strategic management skills. External members may not be Council Officers, employees or contractors. The Chief Executive Officer, Director Corporate, Community and Commercial Services and Internal Auditor are required to attend meetings as permanent attendees with no voting rights. The Committee may invite other Council Officers or Council’s External Auditors to attend meetings as necessary. A sub-committee may be created for the specific review and monitoring of particular internal audit or risk projects. The committee is established for the term of the current Council, unless dissolved earlier by Council resolution. The Committee will meet four (4) times each financial year. The date, time and venue of the meeting will be set by the Chief Executive Officer (CEO) in consultation with the Committee Chairperson. The agenda will be prepared by Coordinator Elected Members and Community Engagement and circulated among members and attendees at least five (5) working days prior to the scheduled meeting. A quorum shall consist of at least half of the members of the committee or three (3) voting members. The CEO must present the report at the Council meeting. Council has adopted a policy to establish an Audit Committee in accordance with Section 105(2) of the Local Government Act 2009 and Section 208 of the Local Government Regulation 2012. In compliance with this legislation, Council has instituted the set up of an Audit Committee (the Committee) to review the integrity of financial documents, monitor the internal audit function and oversee the effectiveness and objectivity of Council’s internal auditors. The Audit Committee provides an independent forum where representatives of council, independent specialists and management work together to fulfil specific governance responsibilities as set out in this Terms of Reference. At all times the Audit committee is to maintain its independence from the day-to-day operations of the Council. c) the effectiveness and objectivity of the local government’s internal auditors. 2. Make recommendations to Council about any matters that the audit committee considers need action or improvement. · Review of management response to external auditor’s recommendation and extent of implementation (assessing the policies and procedures adopted by management to address these matters). · Assess and monitor the effectiveness, independence and objectivity of internal audit. government’s financial statements for the preceding financial year. • Act in accordance with these Terms of Reference. • Ensure the independence and objectivity of the Audit Committee and Internal Audit functions are maintained. The membership of the committee will comprise of two Councillors and four (4) external members, appointed by Council. The Council will appoint one of the external members of the Audit Committee as Chairperson. Council can at any time appoint a stand-in or replacement Councillor member to the Audit Committee. A proxy is not permitted if an external member is unable to attend meetings. Whilst not committee members, the Chief Executive Officer, Director Corporate, Community and Commercial Services and Internal Auditor are required to attend meetings as permanent attendees with no voting rights. The Audit Committee is established for the term of the current Council, unless dissolved earlier by Council resolution. Councillors will be appointed to the Committee for the term of the Council unless otherwise removed by a resolution of Council or acceptance of a resignation. A Councillor seeking to resign from the Committee must provide a written request to the Council. In the event of a Councillor resigning from his/her position on the Committee, the Council will nominate a Councillor to fill the vacant position. A Councillor’s membership of the Committee will automatically expire concurrent with the end of their term on council. Councillors are eligible for re-appointment by Council upon being re-elected. External members are generally appointed for the term of the current Council, unless otherwise removed by a resolution of Council or acceptance of a resignation. An External Committee Member may, by notice in writing addressed to the Council, resign his/her office as a Member. Council may remove a Member from the Committee if a member is unable or unwilling to operate within these Terms of Reference and any relevant policy, procedure or guidelines of Maranoa Regional Council. External members’ membership will expire at the expiry of the Council term. The new Council will invite expressions of interest for membership of the Audit Committee, at which a former external member can re-apply. Remuneration will be paid to each external member as determined by Council. If any Member of the Committee is absent for three (3) consecutive meetings without having obtained leave of absence from the Committee, the Member’s continued membership of that Committee will be referred to the Council for determination. The Chief Executive Officer shall provide administrative resources to the Committee. • Preparation of a written report about matters reviewed at the meeting and the Committee's recommendations about the matters, as required. Pursuant to s.272(7) of the Local Government Regulation 2012, the Audit Committee is exempted from the requirement to keep formal minutes of its proceedings as the function of the Audit Committee is to advise or recommend only. The Audit Committee may request additional resources to be allocated by the Council, subject to agreement with and satisfaction of the Chief Executive Officer that the resources are reasonable, available and will be applied to tasks designed to achieve a specified objective. All such requests will be appropriately recorded and recommended in the Committee Report. In accordance with section 211(2) of the Local Government Regulation 2012 a quorum will be at least half of the number of members of the Committee or three (3) voting members. Unless otherwise provided in these Terms of Reference, the Audit Committee will adopt meeting procedures in accordance with section 270 of the Local Government Regulation 2012. Members present, however if the votes are equal, the Member presiding (Chairperson) has the casting vote. · Each Member of the Audit Committee present has a vote on each question to be decided. · If a Member fails to vote, the member is taken to have voted in the negative. Non-members may, with the permission of the Chair, address the Audit Committee on any item of business listed on the agenda however, a non-member will not vote on any matter at an Audit Committee meeting. Committee meetings shall be held four times in each financial year. The date, time and venue of the meeting will be set by the Chief Executive Officer (CEO) in consultation with the Committee Chairperson. As an indicative guide, the Committee should meet quarterly with meetings arranged to coincide with relevant Council deadlines e.g. to coincide with the requirement for the Audit Committee to review the draft financial statements. The Committee shall recommend to Council if additional meetings are required in order to fulfil their duties. The Audit Committee shall submit a summary of its activities for inclusion in the Council’s Annual Report. A Member has a conflict of interest in an issue if there is a conflict between the Member’s private interest and the public interest that may lead to advice or a recommendation that is contrary to the public interest. Audit Committee members shall absent themselves from meetings when a conflict of interest agenda item is raised. The member will remain absent from the meeting until the agenda item has been appropriately addressed by the Committee. · Section 173 Councillor’s conflict of interest at a meeting. Council's officers must abide by Council’s Code of Conduct and disclosures in relation to conflicts of interest (Conflicts of Interest, Gifts and Personal Benefits and Prescribed Personal Interests). Maranoa Regional Council including Committees appointed by Council, are subject to the Information Privacy Act 2009 (IP Act). Members are advised that personal information of an individual must the handled in accordance with the Information Privacy Principles (IPPs) of the IP Act. Council will ensure that all Members of the Audit Committee are covered by appropriate insurances (eg. public liability). All disputes, complaints and grievances will be handled in accordance with Maranoa Regional Council policies and procedures. I, ___________________________________________agree to be a Member of the Audit Committee and agree to abide by the conditions outlined in the Terms of Reference for the Committee. I understand that the Audit Committee is purely a advisory committee to Council that is designed to discuss key issues, make recommendations to Council as it pertains to the stated purpose of the Audit Committee. I understand however that final decisions will be made by the Maranoa Regional Council and that individual members and the Audit Committee do not hold decision making powers to direct the strategic policy, planning or operations of Council and are not able to commit Council resources. I consent to my personal information by way of my being a member of the Audit Committee or contributions made by myself at the Committee meeting being publicly available and being transferred outside of Australia by means of being published on Council’s website. Council. I also understand that my membership of the Committee may be terminated should a breach of these Terms of Reference occur. An Internal Audit Charter and Internal Audit Plan has been developed to establish an effective and efficient internal audit function that will provide independent, objective assurance and consulting services to Council. That Council endorse the Internal Audit Charter and Internal Audit Plan. Council has previously resolved to establish an Internal Audit Function in accordance with Section 105 of the Local Government Act 2009. This Internal Audit Charter is a formal statement of purpose, authority and responsibility for an Internal Audit function within Maranoa Regional Council. It establishes Internal Audit within Maranoa Regional Council and recognises the importance of such an independent and objective function within the organisation. It also outlines the legal and operational framework under which Internal Audit will operate. The Internal Audit plan has been prepared based on analysis of Management Letters issued during the previous external audit and discussions with Management. The committee also acknowledges that the remaining identified audit projects for FY2015 will be reviewed later in the year for suitable commencement dates to align with the organisational work programs and progress. This policy will guide the conduct of internal audit activities in compliance with the Local Government Act 2009 and the Local Government Regulation 2012. No direct policy/local law/delegation implications arise from this report. Resources for internal audit function are provided for in the annual budget. Corporate Plan 2009-2013 — 8.1.1(a) To undertake all governance functions and activities in a professional manner promoting corporate ethics and integrity and informed decision making practices so as foster an operating environment advocating fairness, equity and consistency. The report tables the draft new Corporate Plan that has been in development over the last 12 months, with increased intensity over the last quarter. The draft plan is tabled for Council’s consideration in sufficient time to ensure that the draft budget and operational plan (work programs) are aligned with the new plan. These are scheduled for consideration and adoption at Council’s planned Special Budget Meeting on 23 July 2014. That the Corporate Plan be adopted, with the first year of the plan being 2014/15. For the first time, the document aims to describe the full extent of the Council operations and its strategic direction. It leverages the significant community engagement that was undertaken in the development of the Community Plan. Whilst the plan itself is no longer legislatively required, the consultation that led to its development was invaluable in guiding Council’s strategies for the future. In fact, the draft new Corporate Plan, as presented, for the first time articulates how Council will deliver upon the community’s aspirations, as identified in the Community Plan. The new organisational structure, and the changes at the Executive management level, have provided a valued and timely input into shaping the organisation’s future. The document as presented is the culmination of the work done for the Community Plan, and most recently a series of workshops with Councillors, Directors and Managers. The document is also informed by the first 20 months of Council’s community engagement activities – with community engagement continuing to be a key priority for this term of Council as reflected in the new plan. Consultation will be ongoing, and it is proposed to make the plan available at a range of forums to encourage further discussion. The Annual Budget will resource initiatives consistent with the Corporate Plan. The purpose of this new policy is to acknowledge Councils obligations as a Public Sector Entity under the Public Interest Disclosure Act 2010 and to establish Councils commitment to the promotion and proper management of Public Interest Disclosures. That Council adopt the Public Interest Disclosure Policy as presented. The Public Interest Disclosure Act 2010 (PID Act) requires a Public Sector Entity’s Chief Executive Officer to establish reasonable procedures for dealing with PID’s and ensure the procedures are published on a website readily accessible to the public. · Updating both our internal and external web sites with the relevant content. This policy has linkages to both our Code of Conduct and Complaints Management Policies. Corporate Plan 2009-2013 — 8.2.3(a) To implement Council’s governance policies and procedures in an evolving organisational environment whilst ensuring legislative relevance, consistency and fairness in application. a) To acknowledge Council’s obligations as a Public Sector Entity as defined in the Public Interest Disclosure Act 2010(“PID Act”). b) To establish Council’s commitment to the promotion and proper management of Public Interest Disclosures. A Public Interest Disclosure (PID) is a report of suspected wrongdoing or danger. For the report to be considered a PID and attract the protections under the Public Interest Disclosure Act 2010 (PID Act), it must be an appropriate disclosure about public interest information made to a proper authority. This policy applies to Councillors and employees, and any person making a Public Interest Disclosure with respect to Council or its Councillors or employees. is a person who makes a Public Interest Disclosure in accordance with the Act. means a public sector entity which includes local government. is a disclosure of information to a proper authority in accordance with the Act, and includes all information and help given by the discloser to the proper authority. (d) a substantial and specific danger to the environment. · A substantial and specific danger to the health or safety of a person with a ‘disability' as defined in the Disability Services Act 1992. · A substantial and specific danger to the environment. · A reprisal taken against anybody as a result of a PID. · the information tends to show the conduct or other matter regardless of whether the person honestly believes the information tends to show the conduct or other matter (objective test). The disclosure is still a PID and covered by the Public Interest Disclosure Act 2010 even if it proves not to contain this type of information. Some disclosures are not protected by the Public Interest Disclosure Act 2010, including disclosures made to the media (except in special circumstances outlined in Part 4 section 20); those made frivolously or vexatiously; those which primarily question the relative merits of government or agency policy; and those that are made substantially to avoid disciplinary action. Disclosures that are wilfully false constitute an offence under the Public Interest Disclosure Act 2010. The disclosure cannot be based on a mere disagreement over policy that may properly be adopted about amounts, purposes and priorities of expenditure. (b) the other person or someone else is, has been, or intends to be, involved in a proceeding under the Act against any person. Is behavior or an action that fails to conform to the standards of law. By virtue of their office or position, Council recognises the important role Councillors, Council employees and members of the public can play in the identification of cases of maladministration, official misconduct and the misuse of public resources or contraventions giving rise to dangers to public health and safety, the environment or to persons with disabilities. iv. afford protection from reprisals to persons making Public Interest Disclosures. These outcomes (including information on how a PID may be made) are achieved via a Public Interest Disclosure Management Plan in accordance with Section 28(1) of the PID Act and this Policy.